For seven years, he graced TV screens all over the world as MacGyver - the hero who could save the good guys from any situation with his trusty Swiss Army knife and a wad of chewed-up gum. 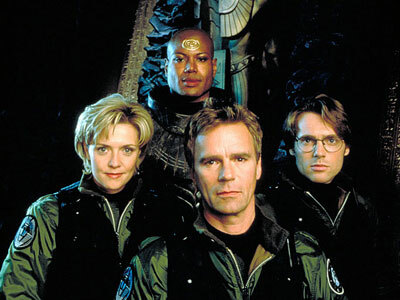 The iconic eighties and early-nineties show made Richard Dean Anderson a mainstream global star and he would go on to win over a legion of sci-fi fans for his eight-year run on Stargate SG-1. 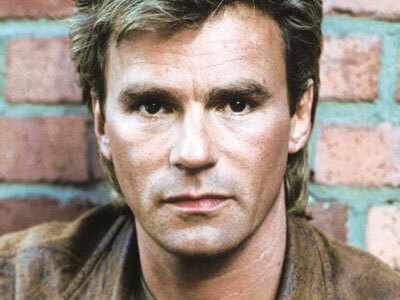 MacGyver started off as a fairly straight action show - albeit one with a champion that used science and logic to win the day, rather than guns, which actually drew the ire of the powerful gun lobby in the US. But as the seasons went on, fans of the show may remember it ventured into social issues. Whole episodes would be dedicated to MacGyver interacting with at-risk youths instead of an arch-nemesis that just wouldn't die. One such episode (which guest-starred future Oscar winner Cuba Gooding Jr) saw MacGyver traipsing through Africa to save endangered black rhinos from poachers. "At that time in my life, I had become more conscious around issues like conservation, and the producers and writers started to take things I was doing or interested in and wrote them onto the screen," Anderson told news.com.au. "I grew up in Minnesota, which is all green and lakes. So I grew up outside and in water." Ten years after he walked away from his regular acting gig on Stargate to raise his daughter as a single dad, Anderson is most passionate when he talks about his involvement with various charities, especially conservation organisation Sea Shepherd. He's listed on Sea Shepherd's board of advisers alongside the likes of Sean Penn, Pierce Brosnan, Sean Connery and Martin Sheen. And a decade ago, he travelled with Sea Shepherd founder Captain Paul Watson to the ice floes north of Nova Scotia, Canada, to monitor a harp seal nursery. When Watson was arrested in Germany at the request of Costa Rica, Anderson filmed a video pleading for his release. He was also on the docks in Melbourne to welcome back Sea Shepherd volunteers from the dangerous Operation Zero Tolerance in 2013. These days, he's said he's less hands-on and mostly gets involved through fundraising for Sea Shepherd. He was in Australia over the last week for Oz Comic Con, in Brisbane and Sydney. "Sea Shepherd is a great part of why I come to these conventions," he said. "We have one next year in Vancouver where all of the funds exclusively go to Sea Shepherd. A significant part of what I make attending these things filters into different organisations, like River Keeper and Sea Shepherd." One of the big marine conservation issues that angers him is illegal Japanese whaling. "The Japanese whaling industry has been blind and deaf to any sort of logic about the 'cultural need' for whale innards," he said. "What Sea Shepherd has been doing for years in the Southern Ocean Whale Sanctuary has been to get in the way of ships that are hunting and harpooning the whales. "We also have an active campaign in the Faroe Islands, a Danish archipelago. We've been trying to get the Danish government to see the light about the ritualistic slaughter of pilot whales that takes place there. "A lot of macho men go out and beat the water to get the whales - babies and mothers - to come into this harbour. Once they're in the harbour they're trapped and the men start slicing them open, spearing them, torturing and killing these sentient animals. "These are very intelligent marine mammals and these guys defend their right to do it on the basis of cultural history. Trying to rationalise something like that in this day and age becomes very difficult, unless you just don't care. Then that becomes a malicious act, which it is. But you can imagine what that harbour looks like. It literally turns crimson." Anderson also said that the Australian government hadn't done enough to ward off illegal whalers, given that it was our responsibility to enforce international law in the Southern Ocean. Onstage at Comic Con, he adorned a Sea Shepherd T-shirt and spoke to his fans about the cause. There was also a Sea Shepherd booth among the stalls of artists and pop culture merchandise. "It's about awareness," he said. "We want people, if nothing else, to educate themselves to what Sea Shepherd does and get involved in any way they can. Whether it's donating money, buying merchandise, attending events where there's a presence or mouthing off to your politicians to do something about marine life conservation." On this latest trip Down Under, Anderson also signed a Sea Shepherd T-shirt, which is to be auctioned off at the organisation's annual fundraiser in November. Sea Shepherd Sydney chapter onshore co-ordinator and offshore crew member Jools Farrell, who was at Comic Con on Saturday, said: "I think the fact that he, and Vikings' Clive Standen (who was also at Comic Con) gave us call-outs help us immensely with people who don't know who we are and what we do. Having people like that speaking for us is huge. "Richard is a huge supporter, he does a lot for us. I went into his Q&A session on Saturday and we were standing at the back with the Sea Shepherd flag and he said 'you guys are awesome'." Ma, Wenlei. 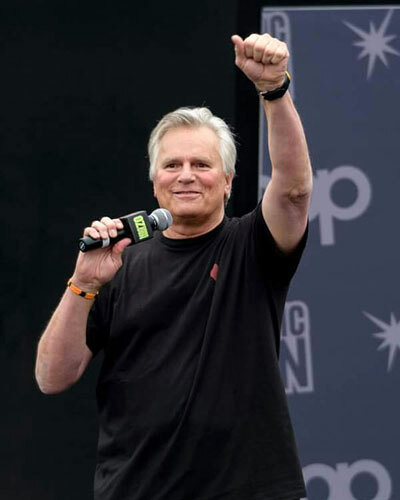 "Richard Dean Anderson on MacGyver and Sea Shepherd." news.com.au. September 25, 2015.